The 2004 USS Nimitz Tic Tac Incident is arguably the most significant recent UFO sighting. So far it has also remained unexplained. But is that because of known facts that can't be explained, or because we don't actually know which information is accurate and what needs to be explained in the first place? This analysis of the various witness accounts, interviews and reports is part of an ongoing effort to figure out what actually happened and which information can be trusted. I have already analyzed the FLIR video and the executive report in more detail here. The idea here is to compare how the sources report certain key details and to estimate the reliability of the information based on how they agree and disagree, and to consider which of the sources would most likely contain the most reliable and original information. This analysis is based on the following sources, which are referred from here on with their short ids. The primary focus is on the first 5 sources, which contain the earliest recorded reports and interviews. Obviously most of these accounts and the vast majority of others in the media rely on the same primary source, David Fravor, especially when it comes to the "main event", the close encounter with that object. We were out flying off of the Nimitz just doing a standard training op, took a vector and headed east towards, sort of heading towards Mexico or the San Diego area. As we approached and and we're looking around we actually noticed down below just above the surface of the water was a really what's best described as a tic-tac. My initial thought was well maybe it's a submarine and it had, you know, had launched a missile. So while it may seem there has been a lot of publicity and accounts for the event, those haven't really been able to take advantage of multiple witnesses. Luckily David Fravor seems to be an exceptionally good eyewitness due to his experience, status as the commander of the squadron, interest of the event, and how he seems to have kept his memories fresh by having kept telling about the event to friends and family over the years, as well as having reported knowledge of techniques for making accurate observations and recalling them. Nevertheless, the event happened almost 14 years ago, which is a lot for anybody's memory, and there are some risks of false memories and excessive confidence in them. Especially since FS describes him having "a typical fighter pilot’s overestimation of his skills." It should be also noted that there has been a couple of recent accounts by the supposed radar operators aboard Princeton and Nimitz, namely those of Kevin Day and "Trevor". Those accounts severely contradict all the other primary sources and contain a number of not too credible additions, e.g. multiple other intercepts and a supposed high quality video of a flying saucer. Since Fravor has made it pretty clear in his recent interviews that the four of them were the only ones who saw such an object with their own eyes, the incident was widely known within the ship, and he with his status would have most likely known all that was important to know about it, there's an obvious discrepancy with accounts that claim otherwise. Given those accounts also lack evidence and supportive statements by the primary witnesses, I won't consider them further here. FLIR plane FAST EAGLE 111? Note that the identifiers used in ES are modex numbers, and those in ER are call signs, so both of them could be correct. The incident can be divided into 3 parts, which are covered by the sources used in this analysis as follows. The most significant uncertainty lies in the connections between these parts. The main question is, did any of those even share the same target? LT [blanked] was clear in that he couldn't confirm that it was the same object as described by the FASTEAGLE flight. He never had visual, only seeing the object via the FLIR. So even though the pilots could identify the target being similar in shape (from their higher quality original tape), there's no guarantee it really was the same target. And the crew that filmed it was predisposed to interpret such target as the Tic Tac they were looking for. It seems the crew, like those viewing it later took the apparent fast acceleration in the video as evidence of it having extraordinary capabilities, but as was already analyzed here before, that apparent "acceleration" most likely resulted simply from the camera ceasing to move. According to ER, the WSO "made no attempt to slew the FLIR and subsequently lost situational awareness of the object". The rest of the video is also inconsistent with something that would simply hover, and instead seems to show a moving target. So basically all the key claims TTSA has made about the supposed capabilities displayed by that UFO seem to be incorrect, and it doesn't actually do anything really interesting in that video, similarly to their other videos. So were there jamming cues or not? Evidently there was a communication breakdown at some point, but was it between the FLIR crew and whoever wrote ER, or between them and Fravor? Since ER should be closest to the source, as it is supposedly based on direct interviews of the FLIR crew too, and contains what seems to be direct quotes by them, it seems more trustworthy for that part. FS is based on that same report, plus personal communications with Fravor, who has claimed there were such cues. It seems FS chose to believe Fravor out of those two main sources, and doesn't mention that discrepancy. Because of these problems, the video doesn't really function as evidence of anything extraordinary and may display a different target. Characteristics Exhibited ballistic missile characteristics in reference to appearance, velocity, indications on radar. Possibility of ice crystals visible on radar discussed. FAST EAGLES (110/100) COULD NOT FIND UNID AIRBORNE CONTACT AT LOCATION GIVEN BY PRINCETON. CAPSULE (ALT 4K FT AT COURSE 300) PASSED UNDER FAST EAGLE 110 (ALT 16KFT). FAST EAGLE 110 BEGAN TURN TO ACQUIRE CAPSULE. WHILE 110 WAS DESCENDING AND TURNING, CAPSULE BEGAN CLIMBING AND TURNED INSIDE OF FAST EAGLE’S TURN RADIUS. PILOT ESTIMATED THAT CAPSULE ACHIEVED 600-700 KTS. FAST EAGLE 110 COULD NOT KEEP UP WITH THE RATE OF TURN AND THE GAIN OF ALTITUDE BY THE CAPSULE. 110 LOST VISUAL ID OF CAPSULE IN HAZE. LAST VISUAL CONTACT HAD CAPSULE AT 14KFT HEADING DUE EAST. So that source only describes the object moving with speeds between 100 and 700 knots, from the first detection to the time of leaving. No hovering, no instant acceleration. The description how Fravor and the object moved in relation to each other also differs from his detailed accounts. Significantly they didn't actually find the contact at the given location, and ER notes that the E-2C didn't see a contact before Princeton gave them instructions where to steer their radars, and after that they saw a contact that was so low they initially thought it was a wave, whereas Princeton had "reported the target to be at 15,000-20,000 feet MSL". ER also notes that "due to the intermittent return from the target, velocity was unavailable" but that Douglas Kurth, who was first vectored towards it, was being told the object was at "slow speed and low altitude". So if they didn't initially find it where Princeton had located it, and it was at a vastly different altitude, do we even know it was the same target? The E-2C target sounds more like the same, being so low and faint. And if the other targets were described as coming down, hovering in place, and then going straight back up, why was it apparently moving horizontally during that time, and why didn't it shoot straight back up? And if there were multiple targets during that instance as well, why did they choose that one to vector the planes to? Was it somehow different from the rest? Was it the closest, even though it was already some 60nm away from the jets? If they had that much difficulty to track that one, would they have been able to see significantly farther similar targets at all? Somehow the target of that one visual encounter and how they directed all the available planes towards it just seems too special to be just one of a dozen or something. Then there's the part when the object supposedly traveled to their CAP after the intercept, some 60 miles in a few minutes. ES doesn't mention that, and ER states Princeton had also lost radar contact when the pilots tried to query it after they lost visual. And not only that, but ER actually states Princeton answered them that "picture was clean" (no contact). That doesn't sound like they had any other objects on the radar either, even though Fravor has described they used to hover at 20kft for 3-4 hours, so seems like an unlikely coincidence if all of them had disappeared so quickly at that time. And if they had something like a dozen others, why would they have assumed the one that popped up on their CAP would be the same one among them all? It seems possible and even likely the majority of those targets were some false targets, as the radar operators already speculated, especially since the radar computer itself apparently "quickly dropped" them "as clutter/false targets". At least the available sources do not seem to give much justification for the assumption that the other targets saw similar objects. The following summarizes the timeline of the events during the actual visual encounter according to the various sources, which once again seem to contain contradictory information on what time the event took place and whether it happened before or after the planned air defense exercise. While the exact time may not be the most important detail there is, it may nevertheless help to estimate the lighting conditions and location of the sun, which may have played a role on how well the crew were able to observe the object from various viewing directions. While the other sources seem to contain local times (L suffix), PR makes things a bit more confusing by referring to Eastern Standard Time (EST) at some points, despite the event happening on the West Coast. And that time difference is going to the wrong direction in terms of getting those times to match with other sources. Much of the available narrative indicates the above events happened close to each other. Kurth was supposedly airborne at the same time as Fravor, who met the FLIR crew while he was taking his flight gear off and they were already putting their gear on, so it doesn't sound like there had been hours between those flights. Like the coordinates, the times would also seem to be the sort of easily available technical information that should have been recorded quite accurately on the navy event log, especially since some of them are seemingly recorded with a 5 minute accuracy or so. Those indicate the intercept happened at 14:30 and some of those earlier morning times are incorrect. ER and FS seem to more or less agree, which is not surprising since one is based on the other, although only one specifies actual coordinates and the directions and reference points are not quite the same. But they contradict Fravor's account of them having flown some 60nm to the west to perform the intercept, as that puts their CAP over Mexico. And none of them agree with PR, which gives a completely different location as well as opposite flight direction for the intercept. If ES is a genuine navy event log for the day, it could be expected to be pretty accurate on technical details such as locations, that should be easily available from the instruments and records of the ship. It provides two coordinates, one for the location of the Nimitz, and the other one, well, what is it? The most obvious interpretation would be that it gives the actual location of the UFO/where the intercept happened. But that would put it more or less to the CAP as described by Fravor (40nm from Nimitz towards 160°, so mostly south). That seems to indicate a different interpretation, that it is the location of the jets when the re-vectoring happened. It looks misleading to indicate the location of the jets instead of the target, but that same logic can resolve another discrepancy in that source when it describes how the object was seen "5NM WEST FROM POSITION OF UNID OBJECT IN WATER". Apparently that also indicates the location of the jet relative to the location of both that whitewater area and the object on top of it, as other sources indicate. Unfortunately that also means ES doesn't specify the location of the UFO at all, and we have to rely on other sources. 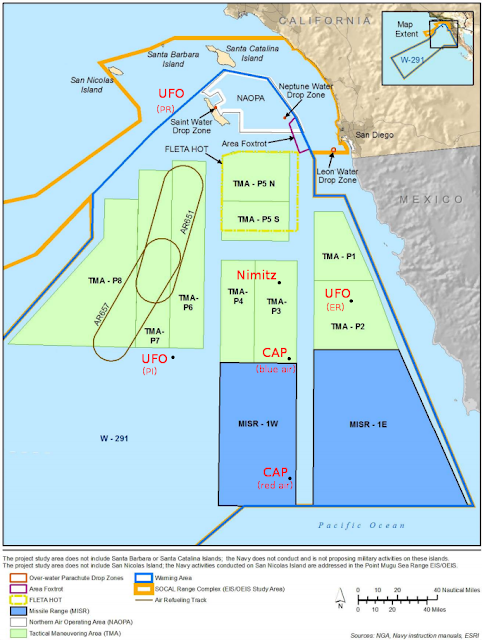 The map below displays the Southern California Range Complex (SOCAL) and locations of the Nimitz and the UFO according to various sources (PI,PR,ER), of which PI is probably closest to the truth. Fravor explained in LMH how their squadron was playing the part of "blue air" in the air defense exercise (ADEX) and a couple of aircraft of VMF-232 were the "red air" and had their CAP point some 60 miles more to the south. Both of those are shown on the map and seem to be close to the corner points of MISR-1W (Missile Range) area. Note that the description is a good match with ES, which specifies two participating aircraft from VMF-232 (303/305), as well as the next event being an ADEX in MISR-1E, putting that next VFA-41 FLIR flight (111) near the same area. ES also supports Fravor's statement that they decided to try to do a run or two of the exercise they were supposed to have on their way back to Nimitz through the CAP. ES also informs us there were a number of other aircraft in flight during event 3, but they were doing bombing exercise (BMB) at oparea 2507, which seems to refer to Chocolate Mountain Impact Area (R-2507), located inland and on opposite direction. All the sources agree that the pilots noticed the area of turbulent water or whitewater before the object. ER and FS describe it also from the point of view of Douglas Kurth, the CO of VMFA-232, who was "completing a post-maintenance check flight not too far away" according to those sources. The estimated sizes vary quite a lot and the shape is described either as roundish or resembling a sunken airliner, so there's clearly some uncertainty in those, but then again, it was an area of water instead of something with clear edges. Even though ES calls it "unid object in water", none of the pilots claimed to have seen an actual object there, the water just looked similar to what a sunken object could have caused. The turbulent water by itself is hardly newsworthy, it could have been a submarine or whales or something, but what made it interesting was the connection to the UFO. But how exactly was it connected? According to Fravor, the object was seen moving erratically and staying low over that patch of water, until it later began to mirror their movements and circle around. He has given highly detailed accounts, in PI for example, on how the object was specifically at a certain position over the 737 shaped whitewater area, not just generally over it, and how it moved over it, like it was checking it out, while they were turning and watching it. ER reports Fravor having said that the disturbance on the water ceased when the object pointed towards them before it began to ascend quickly, a detail he hasn't repeated in his later interviews. However, in PR the pilot of the other jet states that the object "crossed over" that whitewater, just "approximately two seconds after noticing the unusual water disturbance", "from left to right", "at an altitude of approximately 1000-3000 feet", and "appeared to travel at a speed of approximately 300 to 500 knots in a straight line". It's difficult to reconcile those two accounts. ER also notes that there was a differing view, with a description similar but not identical to that in PR. Because the names have been hidden, it is not easy to see who the report is quoting at some points. Especially when two possible people share the same rank, like LT in that instance, which matches both the other pilot and Fravor's WSO. The context and wording however indicates that statement was given by Fravor's WSO. Then we have Jim Slaight, who, as was quoted before, stated they noticed the object "just above the surface". Slaight apparently noticed the whitewater area half a sentence before Fravor. So it seems we have only 2 out of 4 on the record, from different jets, reporting the object low over the water, and only Fravor explaining it hovering/making erratic movements, whereas the other two apparently only mentioned it flying higher up and relatively fast. ES states the object was sighted "5nm west" from the whitewater, but as was mentioned before, that probably just tells us how far the jets were from both the object and the water, although according to Fravor, they should have been to the east from it at that point. That distance together with the altitude of 20-24kft of the jets at that time means they spotted it from at least 11km/7 miles away. The altitude alone means at least a distance of 6km/3.7 miles, and Fravor has said both planes were as high when those observations were made. How much detail could they have seen from that distance, given they didn't have the ATFLIR and its zooming abilities, and apparently just eyeballed it? And do we really have only one detailed account of such an significant part of the event? Multiple reliable and preferably independent witnesses are crucial for incidents like this, since there is no footage or any tangible evidence of the most significant part of the event, and no matter how experienced, all observers are bound to make errors. In principle, that event had 4 eyewitnesses, not quite independent, but at least they saw it from two somewhat different viewpoints. Ideally all of them should have been properly interviewed individually ASAP after the event. Unfortunately, that apparently never happened. Apparently the incident was only investigated in 2009, when ER was compiled, but while FS reports Fravor having told that the investigation "exhaustively interviewed all parties involved", what we see in that report doesn't really look that exhaustive. We can only hope there's some more detailed source material somewhere, but at least that report doesn't contain anything like proper interviews of each crew member. The entire visual encounter is described just from the point of view of Fravor's jet, and it's hard to see from the text if the crew of that other jet were interviewed at all! When ER notes that Fravor and his WSO gave differing accounts how the object moved, it doesn't try to explain that discrepancy in any way. Fravor's description also differs significantly from his other accounts, causing further questions on how the interview was conducted and how accurately the responses were reported. Then there's the speculation of the object possibly demonstrating the ability to 'cloak'. None of the sources indicate any witness having speculated that and ER seems to give that as a possible explanation for why Kurth only saw the disturbance but not the object. Really? Is it really that unlikely he would have missed a white object over an whitewater area from a moving plane from several miles away? Especially since the others also seemed to notice that water before the object, and apparently only one of them was able to describe in detail how it stayed and moved above that area. Was that possibility of cloaking purely an invention of the investigator? Since that investigation, things haven't really improved much. Almost all the accounts have been given by Fravor, and we only have PR by the other pilot and a few sentences on FOX from Slaight. Both indicated the intercept happened in a significantly different location and to the opposite direction of that given by Fravor. If we believe Fravor, "Source" in PR made a number of errors on that account, like claiming Princeton controller being a young woman, while according to Fravor he was a man, and claiming Fravor was concerned of low fuel, while according to Fravor they were specifically sent to investigate because their Super Hornets had significantly more fuel capacity than Kurth had with his older Hornet. "Source" also continued the jets were low on fuel after the encounter and returned to Nimitz, whereas Fravor and ES say that they continued back to their CAP and even made one run of the exercise before returning, so apparently weren't too shaken or in a hurry to go back to tell about it. Interestingly, PR also gave the smallest estimated size for the whitewater area, just 60x80ft = 18x24m, making it seem quite coincidental seeing something crossing it as high as 1000-3000 feet, from a minimum of 6km/3.7 miles away. All those issues and a number of others indicate those other accounts are not that accurate. Which would hardly be a surprise, given that they were taken 13+ years after the event, and there hasn't been any information indicating others had been refreshing their memories by telling the story over the years, as Fravor has done. Furthermore, since we only seem to have one account per person from the others, we can't even tell if their stories have stayed consistent. When it comes to seeing that object hover low over the turbulent water, I guess we just have to trust Fravor on that one, as the alternative is basically that he imagined that whole detailed part of the story. So then again, how was that disturbance connected to the object? Doesn't that look like a good fit for how that turbulent water was being described? And yet different from the rotor wash of a helicopter, which he ruled out. Fravor said it looked like that object was checking out that turbulent water, but isn't it more likely it actually caused that? If we consider the technologies we have that are capable of hovering some 50 feet over water and taking off from there, they will cause downward movement of the air and hence disturbance to the water. It's hard to avoid. Fravor was reportedly looking at those movements from an altitude of 20-25kft, and not straight above, but somewhat to the side, so from a longer total distance, while moving. The sea was calm, so there wasn't any other reference points than the object and that turbulent water, so he probably interpreted the relative movements between those two. What if it wasn't the object that was moving erratically, but that turbulence, e.g. because the object had lift fans or thrust vectoring that had some variance in direction? Could he have told those apart from that far away, without other reference points? None of the sources seem to indicate anyone would have seen the bottom of that object, so why couldn't it be full of more or less conventional propulsion systems, that cause an effect to the water just like they tend to do? Information about the flight altitudes is quite contradictory too. According to ES, Princeton initially informed the object was moving at 25kft at 100 knots, LMH states it was at 20kft, FS says it was hovering at 24kft, whereas ER states it was at 15-20kft and velocity was unavailable due to intermittent radar return, and contrary to Princeton, E-2C detected the target very low over water. FASTEAGLE flights proceeded towards it at about 24kft in ES, 20-24kft in ER, 10-20kft in PR, and 20kft in LMH. There's some variance, but all those agree they were flying quite high, and the second jet stayed high for the duration of the encounter as well. But ER also describes the events from Kurth's point of view, who got there before the FASTEAGLE flights. He was reportedly informed that the object was flying at "slow speed and low altitude" and Kurth flew there at 15-25kft. "While enroute ... he gained radar contact of what he believed to be two F/A-18Fs that were approaching the AAV from the west at low altitude (500-5000 feet). There was no other traffic on the radar. The controller informed him to remain above 10,000 feet, as there was other fighter traffic at low altitude investigating the AAV. As he was flying away he could see the disturbance clearing and could no longer identify the place where it occurred. He did not see any object or vessel associated with the disturbance either above the surface, on the surface, or below the surface. He also never made visual contact with the other fighter aircraft that were vectored to the location or the AAV. Well, that can't be right. Did he just remember the altitudes of those approaching jets incorrectly? Why didn't the others report seeing Kurth on their radars, but reportedly had their screens clean? Or didn't they just mention that one friendly contact? More importantly, if Kurth was far enough from the FASTEAGLE jets so that he couldn't see them, how could he have seen the disturbance clearing, when the others reported it happened only after they had flown at least half a circle more or less on top of it? Or did it actually clear multiple times, as in the object causing it getting high enough from the water at times not to disturb it anymore? It's noteworthy that the contradictions between the accounts by Kurth and the FASTEAGLE jets are not just between the sources but within a single source, ER, which was supposed to be the result of an comprehensive investigation, yet it fails to even mention something is off. When it comes to the object itself, all the sources seem to be in good agreement it looked more or less like a big white Tic Tac. Estimated sizes vary from 25 to 50 feet, but most assume it was roughly of the same size as their fighter jet. An article in Toledo Blade specifies a length of 40ft and width of 10ft, so a 4:1 ratio. Height is not mentioned by any of the sources. However, there's also a curious description of it having a "discernible midline horizontal axis (like a fuselage)". That sounds like there was more to be said about that shape, but it seems none of the interviewers tried to ask about that, and there are no publicly known drawings of it either. For most of the time, the distance between the jets and the object was several miles, with estimated closest distance between Fravor's jet and the object being between half a mile and a mile, and that only happened near the very end of the encounter, when he tried to make a move to get closer to it. The other jet never got anywhere as close to it, yet the pilot of that jet also described it with terms like "uniformly smooth" and it having no doors. What sort of details they could have actually seen from those distances? If it was all white, could they for example see the edges of a white door against a white object, or should we take those statements meaning just that there wasn't anything too obviously visible? How much could it have differed from a plain smooth Tic Tac? It seems none of the interviewers have tried to figure that out. Then there's the question of which sides of the object they saw from close distance. If it mirrored their movements, does that mean they mostly saw it from the side and above? Did they ever get a closer look at its back or bottom, where propulsion systems would likely be? We can also try to estimate uncertainty from the explanations the pilots themselves considered. Slaight said his initial thought was a submarine having launched a missile, but he didn't specify for how long he was considering that. More interestingly, the pilot of his jet considered after the event, back in the ship, that they could have been "deliberately vectored to a testing location of a blue-force weapon system." The investigation in ER also considered that possibility, and noted USS Louisville having conducted a "live fire exercise" "during the period of and in the vicinity of the AAV sightings" but it was determined that "the weapon in use did not match the flight profile or visible characteristics of the AAV" and "any live fire would have been coordinated through the CSG". But it doesn't specify how close in time and location that live fire actually happened, and what were the characteristics that didn't match, and whether they took into account the uncertainties on how accurately the crew actually described what they had seen. The decision to send the jets there also seems to have been made quickly, so maybe those who did that didn't know about the weapons test, as they shouldn't have any need to know, as their planned operating area was far away. Fravor has described on multiple occasions how they circled the object, which began to mirror them. The following figure attempts to visualize what he has told (as seen from somewhere high above). The paths are divided to several numbered steps. 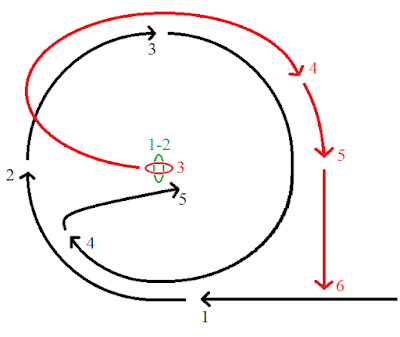 Fravor's path is drawn in black, while that of the object is in red. During steps 1-2 the object stayed pointing north-south direction (marked in green), while performing "erratic" movements. Jets approach from east, at 20kft, notice turbulent water and the object above it on their right side. Second jet is on the left side (towards south) of Fravor's jet. Object makes erratic movements, elongated in north-south direction. (6 -> 9 o'clock) Jets began to circle the object, maintaining their altitude. Object stays close over water. (9 -> 12 o'clock) Fravor decides to check it out, and begins to descend. The other jet decides to stay high cover. At 12 o'clock position the object seems to notice them and turns/realigns its axis towards west. 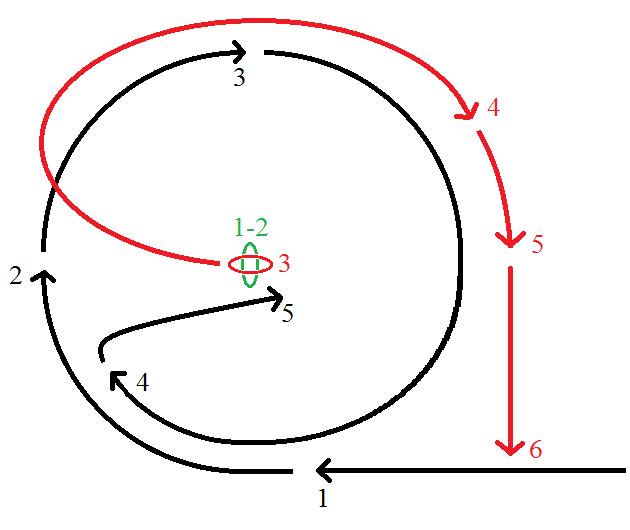 (12 -> 8 o'clock) Fravor continues to circle and descend and the object mirrors them to 2 o'clock position while ascending. Fravor estimated they were about a mile apart in that circle and the object was eventually some 2500-3000 feet below them. (8 -> 3 o'clock) Fravor decides to make an "aggressive out-of-plane maneuver", dumps the nose and tries to cut across the circle to the anticipated position of the object at 3 o'clock. He estimates getting within about a half a mile of it. As the object crosses Fravor's nose, it accelerates rapidly, goes south and disappears. The path of the other jet hasn't been described in detail, but Fravor has said it was initially on their side, so the best guess is probably that it followed more or less the same circle but maintained its altitude. It also seems probable it continued to follow that circle when Fravor made his aggressive move from 4 to 5, which would mean the object would have accelerated behind them from 5 to 6 (and something like a mile away horizontally), which could explain how that jet lost it from sight easily, and maybe also where that claim of the object going aft of the jet came from. Mirror mirror on the wall, who is the one making the moves? The reported mirroring of movements is certainly an interesting detail of the story. We could for example speculate how that would be a relatively simple action to implement in, say, an AI controlled drone, that could measure and maintain the distance to the jet and try keep the distance constant, easily resulting a mirroring kind of movement. But for anyone who has investigated reports like these, it also brings into mind a much simpler and common explanation: the parallax effect. Let's assume the object wasn't actually moving like that, but remained more or less stationary, near the center of Fravor's turning circle, relatively high up. If one believes it's twice as far, and low over the water in the beginning, that belief would basically lead to seeing the mirroring effect. It would seem to follow the same sort of circle, and rise higher as the plane descends. That effect fooled the pilots in the Go Fast video, the crew of the Coyne incident, and has probably been one of the most common mistakes in reported UFO sightings. However, what sets the Nimitz incident apart from most is that it happened in the middle of the day, in what was described as a perfect weather, and was eyeballed from two different vantage points, although, curiously, reported as circling and mirroring from only one of them. Fravor has stayed pretty consistent on how he has described the above flight paths. There are however issues with the other sources. For example, while Fravor has stated the object went south, ES tells the "LAST VISUAL CONTACT HAD CAPSULE AT 14KFT HEADING DUE EAST", and if it supposedly continued to their CAP point, it should have gone eventually to east. Upon noticing the object, OK-2 indicated over the radio, "I'm in!" in which Source replied, "I have high cover". (Source Comment - I was scared because I never encountered a situation like this before and I felt that the object had yet to be identified and we were about to pursue it.) OK-2 conducted an aggressive banking maneuver and dropped their aircraft while turning at the same time in order to catch up with the object. As OK-2 conducted the maneuver, Source noticed the object immediately respond to OK-2's change of direction. (Source Comment - The UFO turned on [OK-2] as if it knew or somehow anticipated what they were going to do and even pointed towards them! I was worried for them because whatever this was, [OK-2] didn't stand a chance against it! There is no way any aircraft or missile that I know of could conduct maneuvers like what we saw that day.) Source indicated that the object began to make deliberate changes in its altitude, attitude, and angle in response to OK-2's aircraft in a manner that seemed to defy the laws of flight physics. The object instantaneously - but in a controlled, intelligent manner - "tumbled" into nonsensical angles that made any engagement by the F-18 impossible. OK-2 and OK-3 were approximately 1000 to 3000 feet from the object when the object turned and "pointed at them." OK-2 conducted one or two evasive turns in their F-18 but the object appeared to maintain positive and dominant control of the airspace. Clearly at least one of them remembers quite a lot of details incorrectly, and seems to have some false memories. According to "Source", Fravor seemed to have performed that aggressive maneuver pretty much as soon as they noticed the object, which responded immediately and even anticipated their moves. "Source" is basically skipping that whole circling and mirroring part. Source also speaks about a number of details Fravor hasn't mentioned, and that do not really fit to his version, like evasive maneuvers by Fravor. It's kind of an obvious choice to rather trust the man who was actually flying the plane and saw the maneuvers up close. Especially since "Source" appears to remember plenty of other things incorrectly. But these vastly different, yet quite detailed accounts provide a good reminder how unreliable witness testimonies can be, especially when they are taken so long after the event. And if Fravor as the primary witness remembers some key details incorrectly, how can we tell? achieved speed 600-700 knots supersonic speed, "horizontal and/or vertical velocities far greater than any known aerial vehicle"
incredible rate of acceleration rapidly accelerates and disappears, literally disappeared, wingman "don't see it at all"
Here's the problem: Not being visible to the F-18 radars is pretty much the only extreme capability that is supported by multiple witnesses. All the accounts about hovering and erratic movements come from Fravor, who has given somewhat varying descriptions between "not fast" movements to those resembling a ping-pong ball. Statements of supposed fast travel to their CAP point are all reported by him, based on radar contacts by Princeton, but since Princeton couldn't actually track it moving there, it's highly questionable. "Source" of PR, The pilot of that other jet, made a number of claims about extreme moves, but those in turn haven't been supported by Fravor, and neither do they fit well to his version of the story. If we compare their stories, at the stage "Source" was afraid and didn't believe Fravor had a chance against that object, the object hadn't even done anything extreme according to the version told by Fravor. Source also described how the object seemed to anticipate Fravor's moves, even though that "anticipation" is curiously explained just as responses to moves Fravor made first, and the closest thing Fravor has described was how he himself tried to anticipate where the object was moving while trying to get closer to it. Cloaking and undersea operating capabilities seem to be just speculations based on some difficulty in first noticing the object from far away, its somewhat submarine resembling shape, and seeing that disturbance in water. All that speculation is on very shaky ground, and may have been invented by the author of ER. The rest of the described flight maneuvers sound like something helicopters or V/STOL aircraft/drones would be capable of, if they could do it fast enough. But how fast was it? As was already discussed, those based on radar returns only (5-7) seem to be highly questionable. Every mentioned horizontal movement on the radar seem to have indicated a very slow speed, from hovering to 100 knots, except for the supposed extremely fast movement to CAP, which apparently wasn't actually tracked by radar, but just assumed to have happened because some contact appeared there. Vertical movements seem to be even more questionable. The supposed acceleration in FLIR was most probably caused just by the camera. That leaves us with what was seen visually. Some of the sources describe how the object passed behind them and tightened its turn, but Fravor has since clarified it never did those things. In his account the only extreme speed seen visually was the fast acceleration when it took off, which "Source" in PR curiously didn't mention at all. "Source" states they lost visual contact "after approximately 8 to 10 seconds", but its not quite clear from where that is counted from. Fravor himself said his wingman "didn't see it at all" at that stage, which sounds more like they didn't see it leaving but were looking elsewhere/lost situational awareness, or something like that. ES just states they lost contact in haze, without mentioning fast acceleration. Velocities and accelerations tend to be one of the most misestimated and exaggerated aspects of UFO sightings, and we also need to consider the possibilities of Fravor just losing track of the object, be it due to other distractions, lighting conditions, or whatever. None of the sources seem to state any of the others would have even seen that acceleration, and ER, which is the closest thing we have of an actual investigation report, simply states "the object ascended quickly and pulled lift vector on and aft of them at a supersonic speed." Since Fravor has said that "pulled lift vector on and aft of them" part isn't correct, we can hardly consider that sentence accurate anymore. All we seem to have is Fravor's estimation, from years after the incident. ES, which should contain the earliest estimate, states that "PILOT ESTIMATED THAT CAPSULE ACHIEVED 600-700 KTS," so on either side of Mach 1. If that is the genuine event log recorded right after the event, why doesn't it mention anything about the supposed extremely fast acceleration? That should have been among the most significant details. PR estimates "object appeared to travel at a speed of approximately 300 to 500 knots in a straight line." Since Fravor has been defending the FLIR video and the acceleration it supposedly shows, as well as the supposed fast travel to their CAP, it does raise the question whether those later reported events have affected his interpretation and memory of how the object left from his view. Those could have functioned as a sort of validation that the object disappeared due to acceleration, and not just because of losing it from sight for other reasons. Since there appears to be only one pilot claiming to have seen it go supersonic, and even that is described in terms of disappearing, and is not mentioned in the earliest source, I think there's a good chance the solution to this mystery turns out to be subsonic. Because of all the contradictions and uncertainties, it's a clear that some of the information we have been given is misleading or just plain wrong. It's just a question of which parts are accurate. This much seems to be clear and supported by multiple sources: There was a disturbance in the water and somewhere near it (to some extent) a white tic-tac shaped physical object that lacked any obviously visible features common for aircraft, and was very stealthy against radar. Its size seemed to be comparable to their fighter jet, or at least half of that. When it comes to what it actually did, the stories seem to diverge. On one side, there's Fravor's account of erratic hovering low over the disturbance, mirrored circular flight, and very fast acceleration. On the other side, we have a somewhat mixed bag of other accounts, that either contradict or do not mention such details. Since those other other accounts seem to contain a number of errors, there's an obvious temptation to just trust Fravor instead, especially since his accounts are so predominant and detailed and he seems to be so confident in the media. But does he really have so much better recollection of the events, or do we just trust him too much? How can we tell, since actual evidence is more or less non-existing and the other accounts we can compare to are so scarce? What sets this incident apart from the typical lights in the sky sightings is that it happened in broad daylight, with what was described as perfect weather, with no cloud in sight. But that combined with the location over the ocean also means it shares one of the typical issues that causes estimation errors during night sightings: lack of visual reference points. And that makes all the aforementioned key movements in Fravor's account suspect. Movement of the object above the disturbance could be confused to movement of the disturbance itself, mirroring could be confused to the parallax effect, and fast acceleration to just losing it from sight unexpectedly soon for other reasons. Having a second jet at a different vantage point could have resolved all of those, but those accounts aren't really good enough for firm conclusions. Since the radar was in the mode to handle Air Intercepts of conventional aircraft it never obtained an accurate track of the AAVs and was quickly "dropped" by the radar meaning it was eliminated by the computer to reduce the amount of clutter on the radar, as any other false target is handled. People have tried to use the sophisticated radar capabilities and experience of the pilots as evidence of how credible this incident and its various details are. But if Princeton had the most sophisticated radar, shouldn't we then trust it when it deemed those targets to be clutter/false? And if the pilots and radar operators clearly stated they couldn't confirm the targets were the same or that they had lost them before seeing a target elsewhere, why would we assume those were the same? As for the pilot experience, Fravor has stated that he was the most experienced of them, Slaight was the second, and the other two who saw the UFO were relatively new. So what could explain the sighting? Let's begin with the one most of us would hope for: aliens. Could aliens explain a white tic-tac? Sure, but then again they could just as well also explain a green cube or a pink pulsating banana. That's the problem, aliens could be used to explain anything, since we don't actually know what to expect from them, and because of that, we should only accept that explanation if we can rule out others that we can actually compare against well defined expectations. Since most UFO sightings have turned out to be something mundane, and there hasn't been a single one that really works as evidence of aliens, the odds are not too great for this on either, especially when we consider all the issues detailed before. Since there's so much uncertainty on the sighting itself, and it's uncertain how much additional accurate details and clarifications we can obtain about it after all these years, the best chance of solving the mystery may be to find some object that could have been there and could explain at least a subset of the described features, as clearly not all of them are accurate anyway. The missile/weapon explanation is attractive for a number of reasons. Slaight stated that being his first impression, and "Source" in PR apparently still considered that after the event. ER also considered that possibility, and even stated there was a submarine doing a "live fire exercise" "during the period of and in the vicinity". That should have screamed for detailed investigation for that possibility, but if it was done, at least it didn't end up being documented in ER, which vaguely mentioned it "did not match the flight profile or visible characteristics". Why couldn't it say what that weapon was? NASA's experimental hypersonic X-43A is one specific aircraft that has been proposed as a potential explanation, especially as something that would have been fast enough to match Fravor's description of how it left the scene. But as a whole, that seems like a highly unlikely alternative. Its reported test flight happened two days later, the location doesn't match any of those proposed by the various sources (even though there's clearly uncertainty about that), it was launched from B-52 bomber at 43kft and flew to 110kft, and isn't that good a match for most of the other reported details. The location would kinda make sense if someone would want to test some secret aircraft in broad daylight, as a military training area far out in the ocean could be closed from most prying eyes during exercises, especially those using live fire. The San Diego area is also within the vicinity of California's "aerospace alley", containing several aerospace/defense companies as well as Edwards AFB with NASA Armstrong/Dryden Flight Research Center. Such testing known only for the higher ups on the carrier could also explain their apparent lack of interest to try to pursue the matter further. While the exact actions by that object are somewhat uncertain, it doesn't seem to fall too far off from period technology, as is typical to UFO sightings of all times. Having the X-43A reach Mach 9.6 just a couple of days later demonstrates that well for speed. The comparison to Harrier is also interesting, as it's one of the few successful hovering capable V/STOL designs, but just some years before the incident there was a renewed interest to develop such technology, combined with supersonic speeds and stealth capabilities, with the Joint Strike Fighter competition. Even though it has wings, there are no vertical control surfaces, and the wings can be difficult to see when viewed from the side, and were colored darker when viewed from below. And being unmanned means getting rid of the glass. High level decisions are made by ground-based pilots but mechanical flying is autonomous. That one doesn't seem to have hovering capabilities, but it is stealthy. Note that the F/A-18F APG-73 radars seemed to be a somewhat aging model at the time, and began being replaced with a new one half a year after the incident, which might be relevant for considering their ability to detect later stealth designs. While to UFO probably wasn't those pictured models (at least the publicly announced flight test dates and locations do not match), they nevertheless demonstrate how there were ongoing projects having at least some resemblance to what was being described, so it's also conceivable there could have been some other developments, possibly secret ones, being tested with more similarity. The various accounts have contained a number of statements about what the object definitely wasn't, and how it probably was out of this world. James Oberg has provided some interesting examples of cases where UFOs reported by pilots have nevertheless turned out to be misperceptions and just what they definitely weren't supposed to be. he's convinced the mysterious craft came from outer space because: It was traveling at tremendous speed, but caused no sonic boom. . . it had a bizarre shape like nothing he'd ever set eyes on . . . and it made a sharp turn while flying at high speeds - an impossible maneuver that would rip any man-made aircraft to bits. Just as incredible, when Capt. D'Alton checked with area air traffic controllers, they hadn't detected a thing! I've flown all over the world, and I know this thing wasn't a shooting star, space debris or the northern lights. Then it took a lightning-fast right-angle turn and zoomed out of sight. Separately, two Tornado jets over the North Sea encountered two large round objects, each with five blue lights and several other white lights around the rim. As the Tornadoes closed to investigate, one of the UFOs headed for one of the jets, which had to take violent evasive action to avoid collision. The two unknowns then headed north until they were out of sight. Nothing showed on the radar screens of the Tornadoes. These recent examples are consistent with the experience of UFO investigators for more than fifty years. Reports of UFO maneuvering, intelligent flight formations, responses to witnesses, and other 'inexplicable' narratives can be engendered from prosaic, simple, but unfamiliar phenomena. In these cases, "UFO reports", even from pilots, did not need a "real UFO" to create them. Whatever the explanation eventually turns out to be, even if it was aliens, we already know one part of it is incorrect information given by the witnesses. It's just a question of which parts, and how badly. Sorry. But you missed a hell of a lot in this report. We/I tracked over a hundred of these objects over the course of several days - all with the highest possible SPY radar track quality. So did the other AEGIS ships in company (HIGGINS, CHAFEE) Post-encounter on the 14th, we watched DX of the intercepts and observed objects going from 28,000 feet to the surface of the ocean in .78 seconds. On the day of Fravor's intercept, there were other 'intercepts' as well; with the objects reacting by falling out of the sky in the manner described above - it was raining UAPs at one point. Just so you know, I grew up in AEGIS (VINCENNES, CHOSIN, PRINCETON) --- 18 years sea time. TOPGUN graduate as well. I know what I saw --- real objects, and aware of us too. Not balloons, not weather, not malfunctions, not ice crystals, and not overactive imaginations. I also observed one of the UAPs through the ship's bigeye binoculars (just a boring white light). Hope that helps. Next time? Don't discount the radar operators in your analysis --- right now, you look pretty silly from my perspective. Otherwise, great report and your skepticism is, as always, justified. I have read about those other intercepts, but I don't quite understand why Fravor and others haven't mentioned them? At least as far as I have seen. And why the investigation report doesn't mention them? Are there any corroborating accounts of those? I haven't really had time to follow this topic lately, so I may not be aware of recent developments. Thank you for your reply. As far as I know, nobody has yet asked Fravor about the other intercepts that occurred. It might help to understand that, normally, intercepts are conducted with the aid of Air Intercept Controller using a radar system. In this case, the other intercepts happened autonomously, the aircrews seeing the objects over LINK 16, and intercepting on their own. Yes, it was chaos for a few moments as the objects dove out of the sky --- as if they wanted absolutely nothing to do with us. When the interceptors left the area, the objects did the opposite --- surface of the ocean back up to 28,000 feet or so in less than a second. Resuming their previous course and speed which was south at 100 kts. As far as other radar operators and ship watch standers not coming forward to corroborate this, I don't have a good answer. As this was my very last underway in uniform, and my very last intercept, perhaps the rest of the crew was informed to remain silent. I never was, never signed or agreed to anything to that affect. Or, maybe they are simply afraid of the ridicule they will receive like I have. I guess what really matters is this … I'm believed by folks at the highest levels in our Government. Perhaps they've seen the missing radar data and have heard the missing voice comms? And this, the truth is coming out --- and based on what I've read above --- it is going to rock Debunker World. If we consider Fravor first, do you agree that he in his position would be aware of those other intercepts? After all, he was the squadron leader, so the other interceptors would have been either under his leadership, or his peers he no doubt knew personally. Also, even if some others have remained silent or have been informed to remain silent, Fravor didn't and wasn't. It's also clear he was personally interested in those events, even if his superiors weren't. Do you agree that he has given his honest account of what he saw and knows, and isn't trying to hide or suppress significant information of those events? I do know for a fact that CDR Fravor was very highly pissed off at the Admiral (won't mention his name as was not at all impressed by the guy either), as he flatly refused to do anything with reports of this incident. It might help to know that Fravor was a first-order warfighter, TYPE A personality. And, he may have signed an NDA even --- I don't know --- maybe he just doesn't care and chose to speak out anyway? When I get the chance, and I will, I will ask Fravor myself about the other intercepts. And get back to you on that question. Also consider this, both Fravor and I had 'weapons release authority' --- meaning we could fire missiles at contacts meeting the right threat profiles in accordance with the Commanders Intent. Myself from the ship, and he from the aircraft. We were both very highly trained, both combat action veterans, both of us spending much of our long careers at war, or in a wartime footing. Think about that for a moment, please? If the Navy would trust us in literally life and death decisions based on our observations, training, and qualifications, you might want to believe me that we were not seeing birds, chaff, balloons, system malfunctions, ice crystals, or the X-43.. these objects were real, these objects were aware of us, these objects reacted to us, and these objects kicked our asses in 'dogfights'. Now what? Fravor has publicly stated he didn't sign and wasn't asked to sign an NDA. The investigative report also mentions one of the pilots stating he wasn't asked to sign any NDA. But you missed the gist of my questions. They were about your personal views, which you don't need to ask from Fravor. So again, do you think it is possible that Fravor in his position wouldn't be aware of those other intercepts? And do you think he has been honest when telling about those events and isn't trying to hide or suppress important information? Indeed, Fravor was absolutely well aware of the other intercepts. These guys were all clowned on the NIMITZ immediately following the encounters. The ship playing Independence Day and Close Encounters of the 3rd Kind over and over. I'm confident that Fravor is telling the entire truth as he knows it. And if he wanted to suppress anything, he would have taken this story to his grave unspoken --- like I had resigned myself to doing before he came out. So we both seem to agree Fravor would have known of such other incidents, and has been telling the "entire truth", yet he hasn't in any way indicated anyone besides the two flight crews that day actually saw such objects visually. He has actually told their flight was the first time jets happened to be airborne when the radar contacts were seen, and he hasn't in any way indicated anyone had seen those afterwards, apart from the one flight crew that took the FLIR. All the primary sources tell a similar story, that the visual sighting of the object was basically a one-off event. So how could we reconcile your story with all that? What we can tell from these observations is that Fravor did not mention/disclose the names of anyone who did not decide to come forward. So, this could be interpretated as suppressing important informations as well but it isn't. Someone I know is going to interview the female pilot who was Fravor's wingman during the intercept. I'll ask this person to ask her about any other intercepts that day. This interview will happen in March 2019. Kevin, it's been 14 years and these events happened for more than one day, how can you tell for sure that the other intercepts happened the same exact day and did they happen after the Flir-1 footage? Did you write notes back then? The 1973 Coyne Incident, also known as Mansfield Encounter, has been described as one of the best UFO cases of all time for the past 45 years. While parts of it have already found more mundane explanations, there hasn't been an adequate explanation that would fully describe the events as reported by the eyewitnesses, both on the helicopter and on the ground. Until now. Executive summary The following is a brief overview of the events. A more comprehensive version of the original story can be read here. The version on the left reflects the eyewitness testimonies and how this story is typically told. The version on the right explains briefly what actually happened, all of which is dealt with in more detail later in this document. It's been a while since we first learned about the existence of the so called Pentagon UFO program. Initial reporting made it sound almost too good to be true with promises of high quality official government UFO evidence. Now that the dust has began to settle, it's unclear whether there is anything of any significance under it. This post is an attempt to piece together information from various and sometimes contradictory sources in order to evaluate what that program actually was and did. The combination of information from early articles with recent revelations seems to result in a reasonably consistent picture already. Initial revelation The existence of the program was initially revealed in connection to the TTSA launch event on October 11, 2017 and a pair of Huffington Post articles by Leslie Kean before and after the event. At the time, nobody revealed the name of the program but it was described as "sensitive aerospace threat identification program". LasVegasNow.com I-Team / George Knapp just published a new article including a "Confidential report" that "analyzes Tic Tac UFO incidents".